By eating healthy you can reduce your BMI. 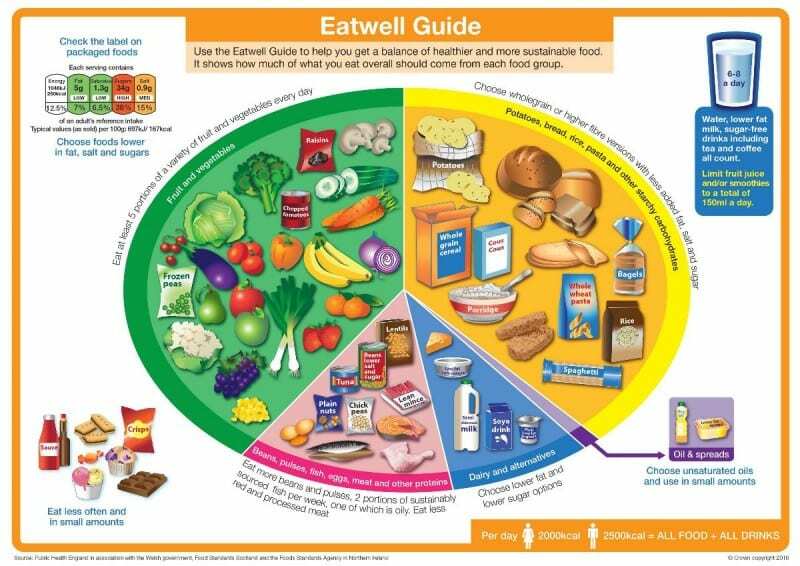 Use the ‘eatwell’ plate below to help you get the balance right. This shows how much of what you eat should come from each food group. Your daily food intake should be balanced as the picture shows, with 1/3 being starchy carbohydrates, 1/3 fruit and vegetables and the remainder being protein foods with as little fatty and sugary foods as possible. Each main meal should contain a form of carbohydrate and some fruit/vegetables. Starchy carbohydrates include all forms of bread, pasta, rice, noodles, couscous, potatoes, chapatis, oats, rye and cereals. These foods provide the body with energy but large portions will result in weight gain. Choose wholegrain, high fibre, wholemeal or brown versions of these where possible. Keep portions small and don’t add extra fat, oil or margarine to them. Eat fruit and vegetables at each meal time and as snacks. Fruit and vegetables can be fresh, frozen, tinned (in natural juice, not syrup) or dried. Eat 5-9 portions a day and fill up on these. A portion fits in the palm of your hand. Choose lean versions of meat, remove the skin from poultry and skim/drain any fat that comes off when cooking meat. Eat red meat no more than twice a week and aim for 2 portions of fish a week, of which one should be oily as these fish contain the important omega 3 oils (haddock, salmon, trout, mackerel, herring, sardines, pilchards, and fresh tuna). 3-4 eggs per week can be safely included in a healthy diet. Vegetarian options include beans and pulses, tofu, soya, quorn, nuts and seeds. If you are not a vegetarian these are also good alternatives to try in main meals, they are often low in fat and high in nutrients. For example, try adding beans and pulses to soups, stews and casseroles. At The Slimming Clinic we educate and support our patients, helping them to change their lifestyle and improve their diet and healthy eating habits. Your slimming plan will be based on the ‘everyday foods’ that you can buy in the supermarket. Using a food diary to write down what you have eaten each day will help you.